The CD10 antigen is referred to as the Common Acute Lymphoblastic Leukemia Antigen (CALLA). It is a type II integral membrane protein of 100 kDa, identified as the human membrane-associated neutral endopeptidase (EC3.4.24.11). It is expressed on uncommitted lymphoid precursors. 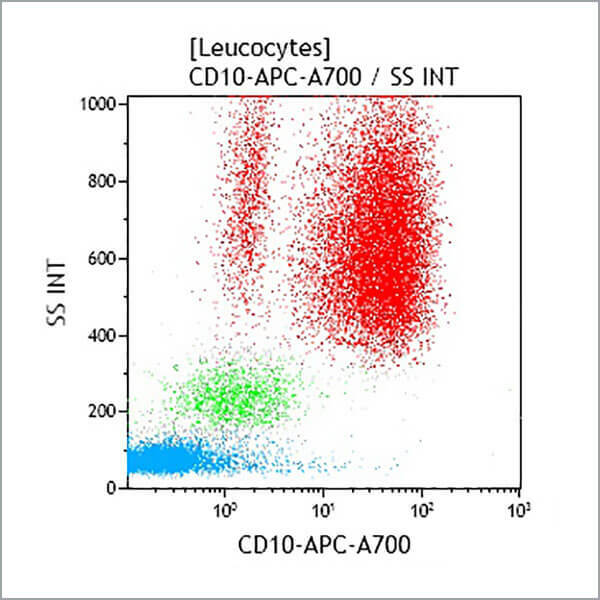 CD10 expression is lost as cells enter the T lineage. In the B lineage, CD10 expression is lost later in ontogeny, as cells acquire surface Ig expression. It is also expressed on activated and proliferating B cells in the germinal center, and on neutrophils as well as on bone marrow stromal cells. It is also expressed on a number of other cells of epithelial origin. *Alexa Fluor and Pacific Blue are registered trademarks of Molecular Probes, Inc.